Address Open to anyone, anywhere. This World Suicide Prevention Day (Sept. 10th), TELL will launch a Give Hearts for Life campaign as part of its month-long actions around World Suicide Prevention Day (WSPD) and World Mental Health Day (WMHD). 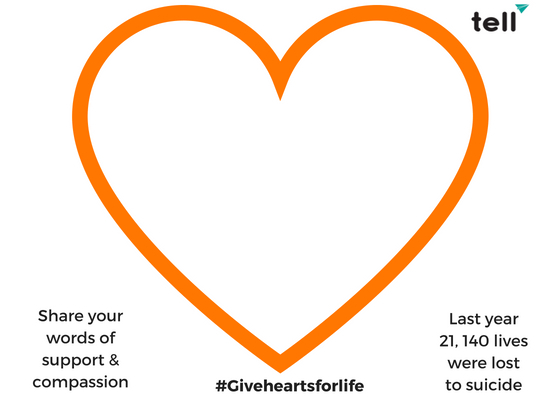 During the #GiveHeartsforLife ♥ campaign, TELL is asking people around the country to write words of support and encouragement to those struggling with mental health issues on orange hearts. The orange heart emoji signifies compassion and care, and TELL will be sharing these messages on our social media platforms throughout the month. Our goal is to receive 21,140 messages to mark the number of lives lost to suicide in Japan last year, and to let those struggling with mental illness know they are not alone. You can also Donate to TELL’s Global Giving Campaign between Sep 10~ Oct 10 and help raise important funds to train more volunteers and extend our hours of Chat Crisis Support. Or join one of TELL’s #GiveHeartsforLife ♥ activities and write words of encouragement and love to others struggling with mental illness on orange hearts. You can make your own orange heart or download one of our templates, share it on social media along with the hashtag – Instagram it, Tweet it or even make a video message. Then, share your message with TELL so together we can let people know they are not alone, they are not weak, and that it is okay to speak up. Our goal is to reach 21, 140 messages, one for every life lost to suicide in Japan last year. Join TELL in our quest to save lives and make zero suicides a reality. TELL’s newsletter keeps you up to date with TELL news, workshops and current mental health news.